Every Long Island driver with a new car has probably shared this same thought when driving it off the lot: “It will never look as good as it does right now.” Once it’s off the lot it’s subjected to the regular wear and tear of everyday driving, but that doesn’t mean that your beautiful new Toyota will never look as amazing as it did in the showroom. With some regular love and attention from you, your favoite set of wheels can be just as shined up and polished as it was when you first laid eyes on it. There’s a lot more to detailing a car then just coming at it with a sponge and a bucket full of soapy water. True detailing takes some effort, but the payoff is totally worth it. If you want some advice on ways to keep your new Toyota looking brand new, look no further - we here at Westbury Toyota have put together a simple guide on how to detail your car without paying through the nose for it. All of this is pretty easy to find at any major hardware or home supply shop, and once you have them, you probably won’t need to buy more for a while. For the sake of making the job easier, it’s a good idea to start detailing on the inside. A good first step is to start by vacuuming the carpets, and then if needed, using a stain remover to get rid of any stains. As the editorial staff at Dmv.org explains, you want to try to use as little moisture as possible when cleaning the carpets in order to prevent any mildew growth. Once you’ve got the carpets tackled, you can approach any upholstery with the same method. Use a stiff-bristle brush to tackle the floor mats if they’re not too bad, but if they’re really dirty you might need to hose them down and give them a good scrubbing. The interior hard surfaces (console, trim, doors, etc.) can all be cleaned with a rag or sponge and a soapy mixture. Once washed and dried completely with a thick cloth, apply the surface protector. 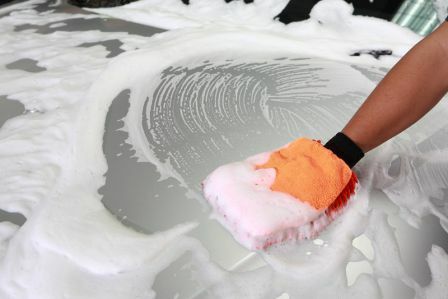 Don’t use a soapy mixture on the dashboard; instead, use a small brush with the cleaning mixture applied and carefully clean around the knobs, switches, and buttons. When it comes to windows, it’s best to use window cleaner as anything else might leave excess streaking. Saving these for last is also a good idea, otherwise you might end up spraying or splashing soapy water all over your clean windows. Before you start soaping down the exterior of your car, make sure you have two buckets to work with. The staff at Autoblog.com explains it best: with one bucket for suds and the other for rinse water, you’re ensuring that you’re only washing your car with clean water instead of just removing the dirt and getting grit in your wash water. Most people start detailing the outside of their vehicle by washing the tires first. From there, move onto the body. If you’ve got some stubborn mud or dirt clinging on, try and use a garden hose or pressure washer to get rid of it. It’s a good idea to tackle this job in small portions so that you can dry what you’ve washed. Otherwise, if you let it air dry, you’ll start seeing streaks. Pay attention to your cloths/sponges/rags, and if they get too gritty, swap them out for a new ones. When it comes time to work on the lights and rims, start using a small brush to get into the crevices and seams. Once the body is dealt with, clean the windows, again making sure to dry carefully and thoroughly in two different directions. Once everything is washed, inside and out, it’s time to apply wax (if you want). It’s generally easier to apply the wax in as thin a coat as you can. If you don’t, you’re going to find that it gets "streaky" and is difficult to remove. Once the wax is applied and dried you might find some deposits or small clumps, but you can easily remove these with a small brush. If you’re worried about your trim while you wax, you can use masking tape to protect it and remove it once waxing is finished. Regularly detailing your Toyota on your own can not only save you money, but ensure that your ride always looks its absolute best. At Westbury Toyota, we understand how important it is to keep your car looking as good as it did the day you drove it off the lot, and that’s why we’ve shared some of our own tips and tricks here to help you out. Once you learn how to do your own detailing, you’'ll have all the insight you need to make sure that your Toyota is never looking less than spectacular when you’re out cruising our Long Island highways.